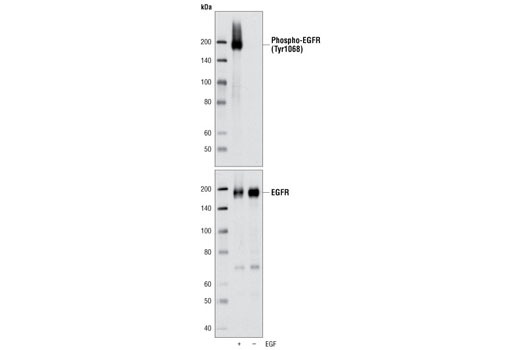 Western blot analysis of extracts of BxPC-3 cells, untreated or EGF-stimulated, using Phospho-EGF Receptor (Tyr1068) (D7A5) XP® Rabbit mAb (upper) and EGF Receptor Antibody #2232 (lower). 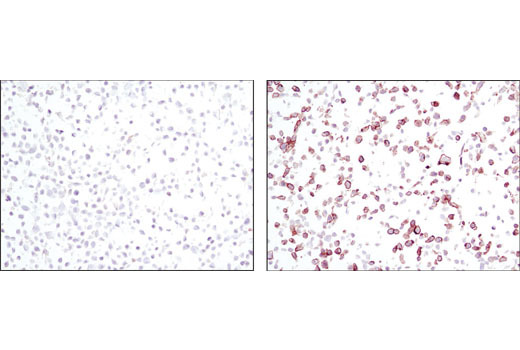 Immunohistochemical analysis using Phospho-EGF Receptor (Tyr1068) (D7A5) XP® Rabbit mAb on SignalSlide™ Phospho-EGF Receptor IHC Controls #8102 (paraffin-embedded KYSE450 cell pellets, untreated (left) or EGF-treated (right)). 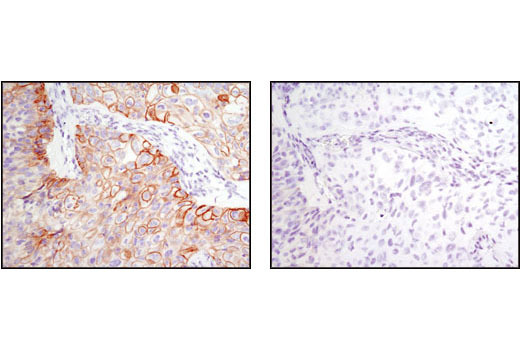 Immunohistochemical analysis of paraffin-embedded HCC827 xenograft, control (left) or λ phosphatase-treated (right), using Phospho-EGF Receptor (Tyr1068) (D7A5) XP® Rabbit mAb. 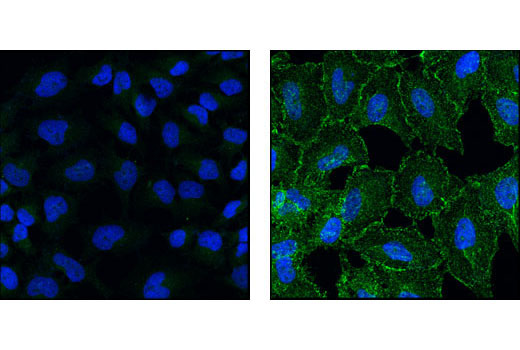 Confocal immunofluorescent analysis of HeLa cells, untreated (left) or EGF-treated (right), using Phospho-EGF Receptor (Tyr1068) (D7A5) XP® Rabbit mAb (green). Blue pseudocolor = DRAQ5® #4084 (fluorescent DNA dye). 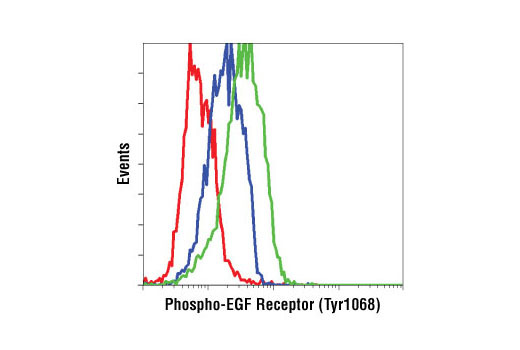 Flow cytometric analysis of A549 cells, untreated (blue) or EGF-treated (green), using Phospho-EGF Receptor (Tyr1068) (D7A5) XP® Rabbit mAb compared to concentration matched XP® Rabbit (DA1E) mAb IgG Isotype Control #3900 (red). 1X EDTA Unmasking Solution: To prepare 250 mL of 1X EDTA unmasking solution, dilute 25 ml of SignalStain® EDTA Unmasking Solution (10X) (#14747) with 225 mL of dH2O. 1X Animal-Free Blocking Solution: to 4 mL of dH2O, add 1 ml of Animal-Free Blocking Solution (5X) (#15019). For EDTA: Heat slides in a microwave submersed in 1X EDTA unmasking solution until boiling is initiated; follow with 15 min at a sub-boiling temperature (95°-98°C). No cooling is necessary. Incubate specimen in fluorochrome-conjugated secondary antibody diluted in Antibody Dilution Buffer for 1–2 hr at room temperature in the dark. Phospho-EGF Receptor (Tyr1068) (D7A5) XP® Rabbit mAb detects endogenous EGF receptor only when phosphorylated at Tyr1068. This antibody may cross-react weakly with other tyrosine-phosphorylated proteins. Monoclonal antibody is produced by immunizing animals with a synthetic phosphopeptide corresponding to residues surrounding Tyr1068 of human EGF receptor. The epidermal growth factor (EGF) receptor is a transmembrane tyrosine kinase that belongs to the HER/ErbB protein family. Ligand binding results in receptor dimerization, autophosphorylation, activation of downstream signaling, internalization, and lysosomal degradation (1,2). Phosphorylation of EGF receptor (EGFR) at Tyr845 in the kinase domain is implicated in stabilizing the activation loop, maintaining the active state enzyme, and providing a binding surface for substrate proteins (3,4). c-Src is involved in phosphorylation of EGFR at Tyr845 (5). The SH2 domain of PLCγ binds at phospho-Tyr992, resulting in activation of PLCγ-mediated downstream signaling (6). Phosphorylation of EGFR at Tyr1045 creates a major docking site for the adaptor protein c-Cbl, leading to receptor ubiquitination and degradation following EGFR activation (7,8). The GRB2 adaptor protein binds activated EGFR at phospho-Tyr1068 (9). A pair of phosphorylated EGFR residues (Tyr1148 and Tyr1173) provide a docking site for the Shc scaffold protein, with both sites involved in MAP kinase signaling activation (2). Phosphorylation of EGFR at specific serine and threonine residues attenuates EGFR kinase activity. EGFR carboxy-terminal residues Ser1046 and Ser1047 are phosphorylated by CaM kinase II; mutation of either of these serines results in upregulated EGFR tyrosine autophosphorylation (10). Hackel, P.O. et al. (1999) Curr Opin Cell Biol 11, 184-9. Zwick, E. et al. (1999) Trends Pharmacol Sci 20, 408-12.
Cooper, J.A. and Howell, B. (1993) Cell 73, 1051-4. Hubbard, S.R. et al. (1994) Nature 372, 746-54. Biscardi, J.S. et al. (1999) J Biol Chem 274, 8335-43. Emlet, D.R. et al. (1997) J Biol Chem 272, 4079-86. Levkowitz, G. et al. (1999) Mol Cell 4, 1029-40. Ettenberg, S.A. et al. (1999) Oncogene 18, 1855-66. Rojas, M. et al. (1996) J Biol Chem 271, 27456-61. Feinmesser, R.L. et al. (1999) J Biol Chem 274, 16168-73.